Quintana Roo is the latest state to see a self-defense group form in response to the inability of authorities to control crime, corruption and impunity, according to mexiconewsdaily.com. Yesterday, a group of 20 business owners headed by real estate entrepreneur Carlos Mimenza announced the formation of a group to combat rising levels of insecurity and corruption that they say are provoked by the current government. After initially supporting Governor Carlos Joaquín González, they say they now feel betrayed by his actions. González assumed office in September last year after Roberto Borge, who is currently detained in Panama, completed his term. “The self-defense project is very serious. Violations of the law by the current government are very repetitive, we have evidence of the corruption and authorities are simply not acting,” Mimenza stated in an interview with the newspaper Reforma. Mimenza cites the example of former municipal police officer Héctor Casique Fernández, who died earlier this month while under state protection. Casique was imprisoned for three years during Borge’s administration and forced under torture to confess to being involved in organized crime. Mimenza alleges that state authorities were responsible for his death. 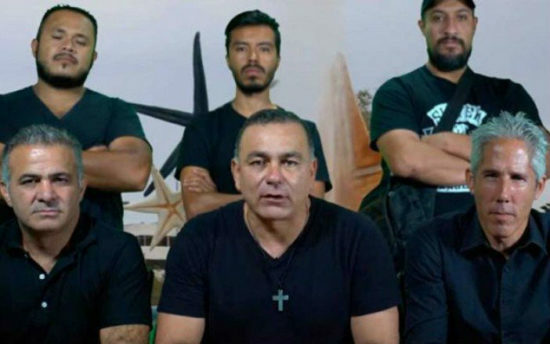 The group released a video yesterday featuring Mimenza and five other men — all dressed in black and who remain silent throughout — warning that the self-defense group would be keeping an eye on the actions of state officials. “The makeup of this group includes 200 people [who are] ready to act in the case of an attack against us or our close circles,” Mimenza warned while his partners either nodded their heads in agreement or simply continued to stare at the camera. He also warned that members of the group had even infiltrated government and were monitoring their actions from within. Mimenza — who has a history of speaking out against politicians he believes are involved in illicit activities such as money laundering and embezzlement — encouraged other people to get involved with the newly formed vigilante group. The founder of a self-defense movement in Michoacán, José Manuel Mireles, was cited as an inspiration to the group and also appeared in the video to offer his support. Mireles also recognized the contribution of “mini-Deputy” Ángel Jacinto Noh Tun, a 12-year-old boy who made a fiery speech against corrupt politicians at a children’s parliament in the state earlier this year. However, Mimenza made it clear that the founder of the Michoacán force was not directly involved in the Quintana Roo movement. At the conclusion of the video, an increasingly aggressive Mimenza urges people watching to share it before ending with an ominous warning. The state government later issued a press release in response. It also asserted that investigations were under way in relation to allegations against the former government. Esos son my Paisano’s tienen huevos to estoy con ustedes Mexico inplora Mexicanos co mo ustedes y lo exije dios.